This week's quote comes from William Arthur Ward, an American writer excelling in inspirational maxims, such as the one above. 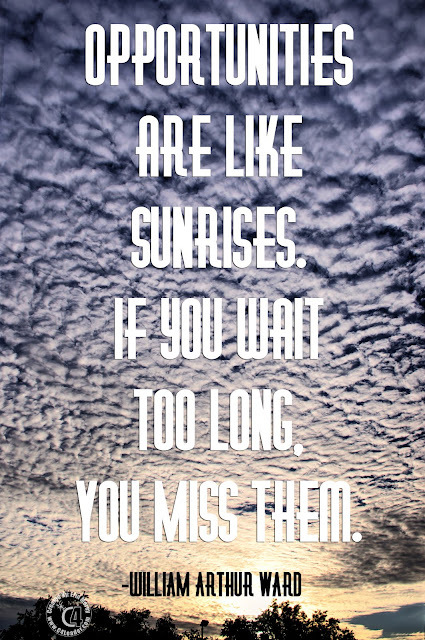 I love this one, because I am an early riser so I get to see sunrises. Of course, Houston could use a little more sun and less rain today, but that's another conversation. Now I need to make the same effort to take advantage of opportunities. Too often I want things to be perfect. Because of that, opportunities may pass me by, or I may take too long to enjoy the fruits of them. For leaders and business owners, this is especially poignant, as it can make or break a business. Perfect is the enemy of done, as nothing will ever be perfect. Enjoy the sunrise, and don't be afraid to take advantage of the opportunities! Join us today at 12CST on Periscope for our Leadership Lunch, where we discuss the quote of the day. If you missed one, previous Lunches can be found on our YouTube channel!